Cardiac hypertrophy is defined as an increase in the size and weight of the myocardium. It generally results from increased pressure load while increased volume load (for e.g. - valvular incompetence) results in the hypertrophy with dilation of the affected chamber due to regurgitation of the blood through incompetent valve. 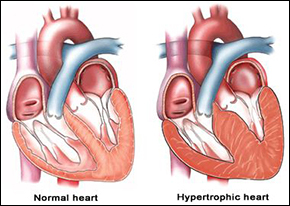 This hypertrophy when occurs in the left valve of the heart is known as left ventricular hypertrophy. This is condition in which muscles of the heart that are pumping blood to the left valve becomes excessive thickened. The atria of the heart may also undergo compensatory changes due to increased work load. The basic factors that stimulates left ventricular hypertrophy of the myocardial fibres are not known. It appears that stretching of myocardial fibres in response to stress induces the cells to increase in length. The elongated fibres receive better nutrition and thus increased in size. Other factor responsible for causing this disorder may include anoxia and influence of certain hormones (e.g. -catecholamines and pituitary growth hormones). Older people are more prone to this disease. Mainly women with hypertension are at higher risk to suffer with left ventricular hypertrophy. Various genetic conditions are also associated with left ventricular hypertrophy. Diabetes and hypertension are two major factors that contributes to cause this disorder. Conditions with increased cardiac output e.g. thyrotoxicosis, anaemia and arteriovenous fistulae. 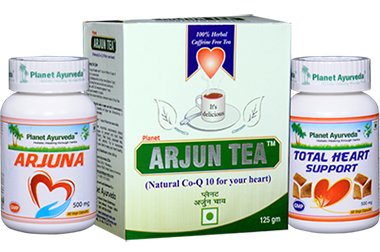 Arjuna tea is very effective herbal formulation for treating various heart disorders and used to maintain normal health of heart muscles. According to Ayurveda principles arjuna is the major herbs used for treating heart conditions from 1000 years. Natural anti-oxidants present in this herbal tea is used to lower down high blood pressure. It also helps to bring down higher cholesterol level. Regular intake of this herbal tea two times a day helps to regulate normal blood pressure and also fight with various heart conditions like coronary artery disease and congestive heart failure. This herbal tea is very effective remedy for treating left ventricular hypertrophy because it helps to strengthen heart muscles and remove extra blockage in heart. Enzymes present in this herbal supplements helps to nourish and strengthen heart. It helps to enhance the pumping capacity of heart and also helpful in toning arterial muscles. Major ingredients used to prepare this herbal tea are arjuna, punarnava, pippaltwak, dalchini and chotielachi. All the herbs are cardio-protective in nature. Punarnava is diuretic herb and it also helps in the relaxation of heart muscles. All these herbs works wonderfully to treat the underlying symptoms that are responsible for causing major heart disorders. This herbal tea is free from caffeine and its delicious taste makes it easier to intake. Dosage - 2 cups, two times a day. Natural extract of herb arjuna is used to prepare wonderful supplement of planet Ayurveda to aid with various cardio-vascular ailments. Bark of this tree contains various flavonoids, saponnins, tannins, glycosides and enzymes that are used for treating various heart disorders. Bark of this tree has hypotensive effects and it helps to regulate and increase normal coronary artery flow in body. It also helps to prevent heart from ischemic damage and congestive heart failure. Anti-oxidant nature of this herbal supplements protect heart from harmful actions of free radicals and toxins. It also act as diuretic in nature and due to these properties it helps to lower down high blood pressure level in body. These natural capsules act as cardiac tonic and helps to maintain normal health of heart muscles. Regular intake of this herbal supplement helps to improve capillary circulation and lowers down high triglyceride level in body. This herbal formulation is also very beneficial for diabetic sufferers because it helps to maintain normal insulin production in body. 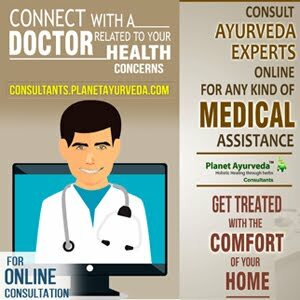 This herbal supplement also helps to pacify vitiated doshas in body. Dosage- 2 capsules two times a day after meals with normal water. Total heart support capsules is again very effective and safe herbal formulation for healthy heart. Arjuna, ashwagandha, shankhpushpi and brahmi are the various effective herbs used to prepare this herbal supplement for heart care available at planet Ayurveda. Regular intake of total heart support helps to treat angina, myocardial infarction and congestive heart failure. It helps to reduce high cholesterol and blood pressure level. It gives natural strength to heart muscles and helps to detoxify toxins that are harmful for heart cells. It helps to increase the stamina of heart muscles to pump blood more easily and comfortably. Try to monitor your diabetes and hypertension properly. Avoid excessive smoking and alcohol intake. Try to make regular schedule for physical exercise because it helps to lower down hypertension normally. Try to take healthy diet. Avoid salty, fried, packed, heavy meals and carbonated drinks.